Happy Monday everyone! Let’s start the week with a smile on our faces, despite the grim weather and the tons of things on our to-do lists. Let’s start it with a big cup of delicious coffee, feel-good music and sleepy good mornings to the ones we love. Let’s start it easy, pacing ourselves for the upcoming days, celebrating the season and all the colours that come with it. All the reds, greens, silvers and golds- and orange too! Orange for persimmons, those little beauties that are totally seasonal, totally tasty and totally versatile. Up until a couple years ago, I had no idea what a persimmon was. I would see them on market stalls and we’d look at each other- just look, no touching, no tasting. Eventually, I looked them up, I tried to find out more, I learned how to pronounce their name. And eventually, I had a bite. So tasty, so subtle, not too juicy, not too sweet, just right. 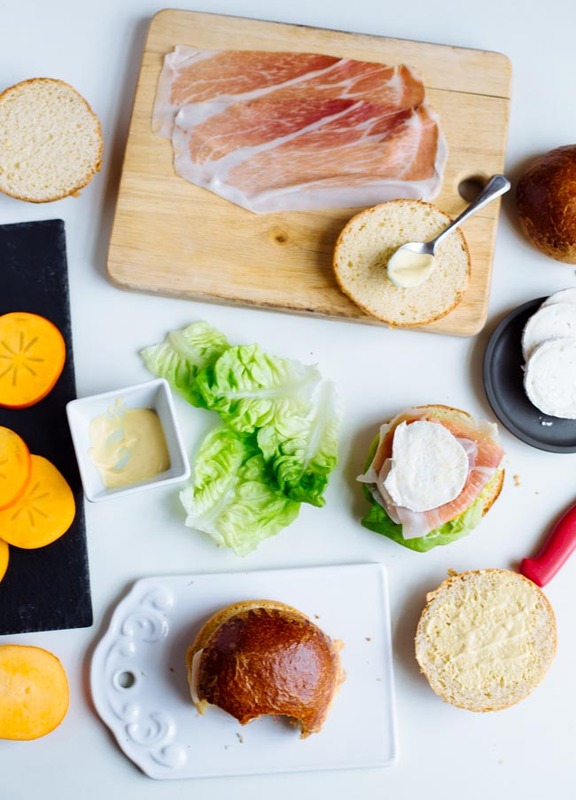 Ever since, I’ve used them in salads a lot and added them to cakey loaves, but my favourite way to eat them is in an as-simple-as-it-gets sandwich. I love homemade sandwiches so much- almost as much as I despise store bought ones. They take mere minutes to prepare and if made with some care and good ingredients, they can be immensely satisfying. 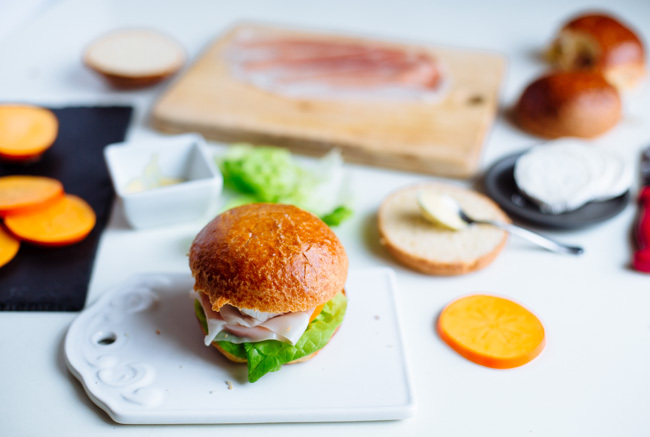 This persimmon, parma ham and goat cheese sandwich really is as simple as it gets: inspired by the BLT, packed with beautiful flavours and lots of texture, it’s definitely worth giving a try. 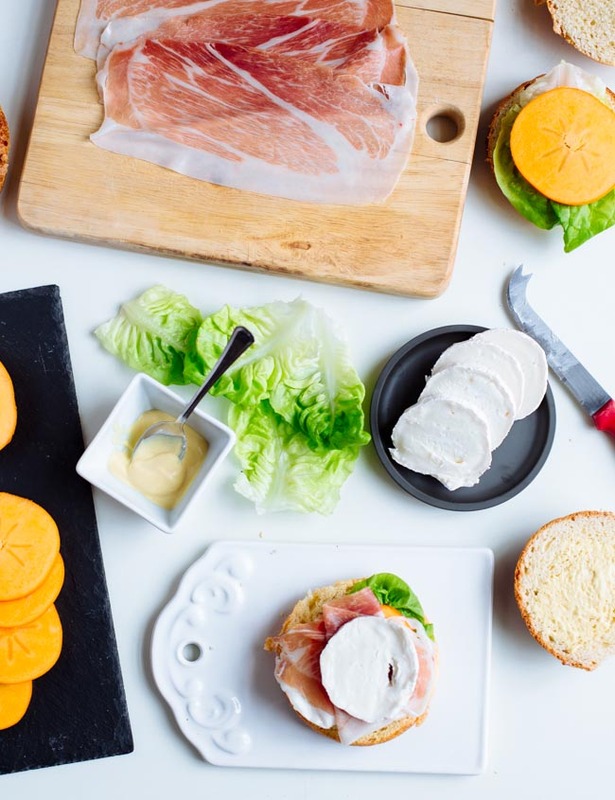 Beautiful, ripe fuyu persimmon, slices of subtly salty parma ham, deliciously soft goat cheese and fresh, crunchy lettuce. 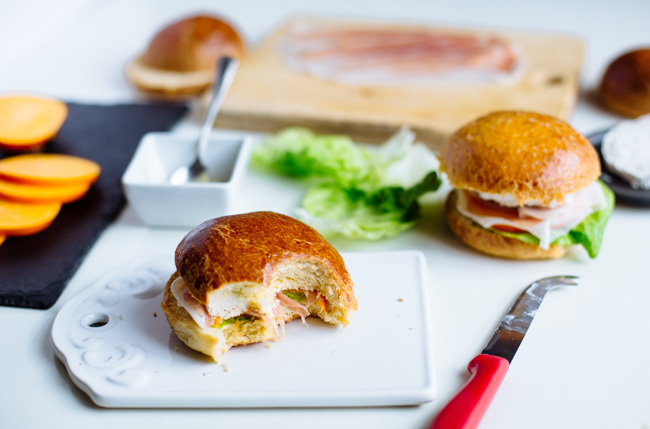 No baking, no cooking whatsoever; just slice and stack inside a nice, chubby brioche, along with a thin layer of yogurt & mild mustard. Eat, repeat. Easy, uncomplicated and so satisfying. Here’s hoping our week will be just the same. 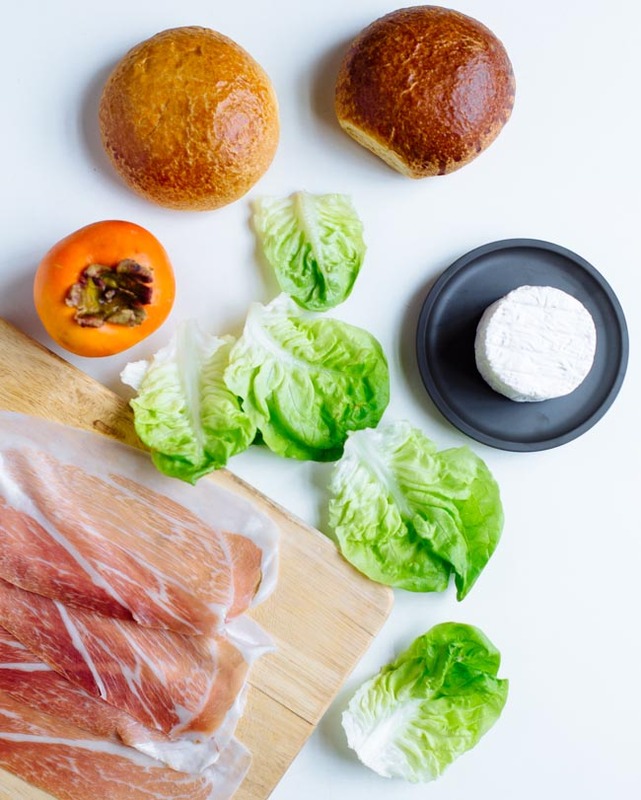 Cut the brioche in half and spread a thin layer of the mustard & yogurt mixture on each side; arrange the lettuce, persimmon, parma ham and goat cheese on top of the bottom side and top with the remaining side.